Yes, a proper licensed DC Comic branded slot with the young Linda Carter featuring as Amazonian super-heroine Wonder Woman, cleavage and all. Scientific Gaming, now owners of WMS, Bally and Barcrest are issuing many slots nowadays, but seldom any innovation. So will this Justice League demigoddess be able buck that trend? There are 40 paylines over 5 reel of 4 rows. Wonder Woman herself appears as the expanding non-multiplying Wild on the centre 3 reels, and her logo is a scatter on reels 1, 3 and 5. There are no random in-play features, just one free games round. The symbols have low awards, as they are stacked and some of the cards (10, J etc.) pay less than 1x stake for 5-of-a-kind (5OAK), in fact only 0.4x stake. Even the highest symbol pays only 3x stake for 5OAK. 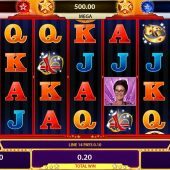 There are 3 jackpots Minor, Major and Mega which are awarded by getting their appropriate colour jackpot symbol on reels 1 and 5. You have the Wonder Woman theme tune playing during the bonus rounds and the sound bytes during the game itself. 3 gold scatters on reels 1,3 and5 trigger free games. You can choose 8 free games where Wonder Woman substitutes for A, K, Q and J, 16 games where she substitutes for A, K and Q or 24 free games where she substitutes for just Q and J. There are no retriggers and its very hard to hit 5OAKs in this feature. 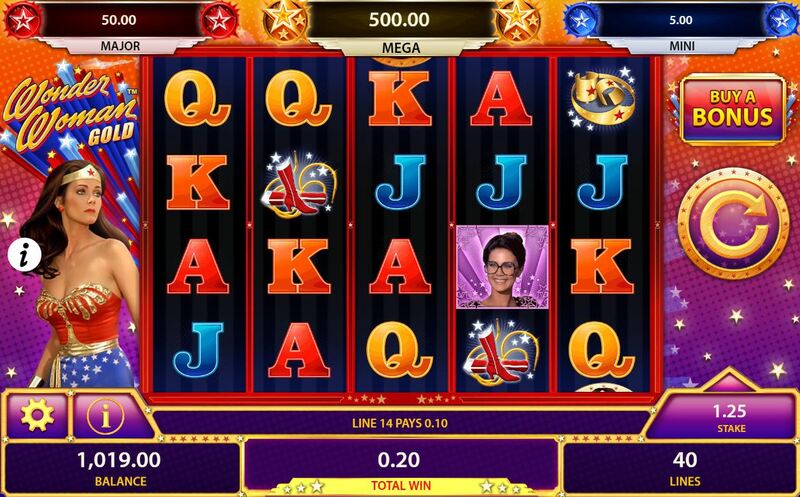 Like many other Scientific Gaming slots, Bally have a version of Big Bet - you can select to buy the feature every spin, so not play the base game. You will pay a multiple of the basic stake to do this, say 8x or 16x right up to hundreds of units per spin. If it feels like I have rattled through this slot review very quickly, then you wouldn't be wrong at all. Wonder Woman Gold is big on visuals, sounds and brand awareness, but lacking in so many other ways that it is scary. The pays are awful in the base game and the variance is so low that the game becomes pathetically tedious very quickly. This is likely a deliberate move by the developer to encourage the ridiculous big bet 'Buy A Bonus'. In my opinion, if you need to buy the feature, the game really isn't worth playing and hardly an advert for Responsible Gaming. When you consider the RTP is just over 95% for playing 'normally' and just over 96% for Buying the Bonus each spin. Wonder Woman Gold has left little wonder and is likely to be cast to back of the games lobby before it even gets any chance of taking off. You might be better off enjoying the DC Comics slot Justice League from NextGen, much more excitement going on here.